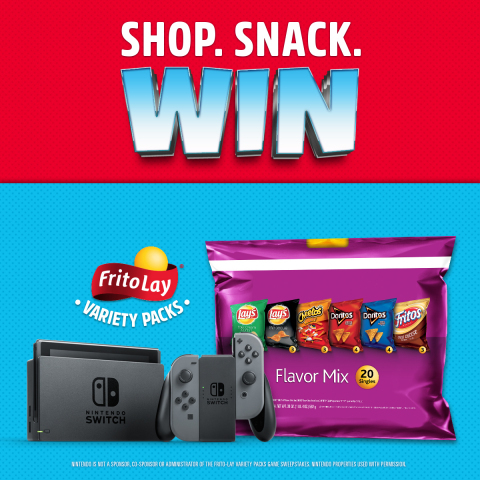 REDMOND, Wash.--(BUSINESS WIRE)--The next time you pick up a Frito-Lay Variety Pack, one of the flagship brands from PepsiCo’s Frito-Lay division, you also might pick up a Nintendo Switch gaming system. Between now and July 8, Frito-Lay is giving away one Nintendo Switch system and a game every single hour! Specially marked Frito-Lay Variety Packs contain information about how U.S. residents can enter for a chance to win. Frito-Lay Variety Pack includes pre-portioned bags of everyone’s favorite Frito-Lay snacks, such as: Cheetos cheese flavored snacks, Doritos tortilla chips, Fritos corn snacks, Funyun’s onion flavored rings, Lay’s potato chips, Rold Gold pretzels, Smartfood popcorn and SunChips multigrain snacks. Variety Packs are available at retail stores nationwide for a suggested retail price of $3.60 - $8.99. For additional details about the Frito Lay presents the Nintendo Switch Giveaway, visit http://www.flvpgamegiveaway.com. Frito-Lay Variety is one of many Frito-Lay brands in North America - the $14 billion convenient foods business unit of PepsiCo (NYSE: PEP), which is headquartered in Purchase, NY. Learn more about Frito-Lay at the corporate website, http://www.fritolay.com, the Snack Chat blog, http://www.snacks.com and on Twitter at http://www.twitter.com/fritolay. Learn more about Frito-Lay Variety Pack by visiting www.MyDreamvention.com.